The first time I met Ben Sollee when he came to perform for us during our training in Washington DC at our Annual End Mountaintop Removal Week in Washington. There were close to 150 concerned citizens from California to the Carolinas, and many who were directly impacted by mountaintop removal. Armed only with his cello and soulful voice, Ben made many of us in the room cry with his awe-inspiring rendition of “A Change is Gonna Come”. It was definitely the highlight of the day. The album is a collaboration between Ben, Daniel, and producer/recording artist Yim Yames. Recorded in the first half of 2009 in Kentucky, the album explores the Appalachian home they love and aims to draw attention to the issue of mountaintop removal coal mining and its impact on the people and heritage of Central Appalachia. The album is folky and light, but it’s also got their shared spirit of altruism and activism thread throughout the record, specifically the impact of the Mountaintop Removal coal mining and its impact on the people and culture of Appalachia. The title track best represents the spirit of the album… While Martin’s voice, which is haunting and engaging as it moves through the beat as steady as a knife and as thin as a vapor, dominates the track, Sollee’s musicianship punctuates the track, creating much of the feel of the song and moving it along in a frantic pace unlike any other mountain jam you’ve ever heard without losing the emotional connection. Appalachian Voices staff will be on hand for much of the tour to educate the audiences about mountaintop removal. We want to take this opportunity to thank Ben, Daniel, Yim and Sub Pop records for using the power of music to raise awareness about the threat that mountaintop removal poses to America’s beloved Appalachian mountains. Buy it: Your local music store, Amazon.com, or donate to Appalachian Voices to receive a free copy! Kentucky-native Ben Sollee performs a unique synthesis of folk, soul, jazz and bluegrass, choosing a cello rather than a guitar as his instrument. Sollee received critical praise for his 2008 debut album, Learning to Bend, and was chosen as one of NPR’s “Top 10 Unknown Artists of the Year.” Ben has been known to strap his cello on his back and ride his bike from one gig to the next, and has collaborated with numerous luminary musicians such as Otis Taylor and Bela Fleck. 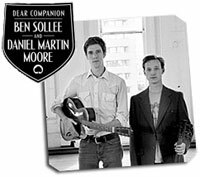 Daniel Martin Moore is a singer and songwriter from Kentucky known for his deceptively simple, soft playing style which has been compared to Nick Drake and M. Ward. His first album, Stray Age, was released at the end of 2008 by Sub Pop Records and was produced by Joe Chiccarelli (The White Stripes, U2, The Shins). Producer Yim Yames is a renowned guitarist/singer/songwriter from Monsters of Folk and My Morning Jacket. With Colombian roots, a Philadelphia, Pa.-childhood, and more than a decade in Florida before joining Appalachian Voices, Sandra served as AV's North Carolina campaign coordinator and driving force behind the Red, White & Water campaign from 2007 to 2013.